Bread, olive oil & aromatized butter. Low temperature egg, peas, smoked pork loin. Tomato soup, fried “açorda”, codfish roe. Vegetables tempura, pickles and leaves. Sautéed octopus, fried rice balls, Portuguese cabbage and aioli. Cockle rissoles with season broth rice. Tapioca, asparagus and shaved aged cheese. Selection of season sliced fruit. Nice waiters, quickly served, lovely atmosphere, beautiful views. Delicious octopus. Very cosy restaurant located on the riverfront, with a beautiful view of service Porto. The staff was very friendly, welcoming and professional. For our mains we had the octopus and tuna steak, both of which we highly recommend. For desert we tried the lime crumble, the pear cooked in Port wine and a cheese pie with Port wine ice cream - all of them were lovely. I would higly recommend this restaurant to anyone looking for a quality meal. Definitely worth the price tag. Thank you for your kind words, we are very pleased with your review, we hope to see you again in our restaurant! Quiet place and wonderful views. The service is quite good, as the quality of the food. There are few options to chose in the menu, but they’re good. Thank you so much for sharing your experience at The George. Our team is very happy to know that we could meet your expectations and made your vist memorable. We hope that you can visit us again. What a surprise. My best meals in Porto. Great wine, great food at fair prices. Loved the octopus! Thank you for taking the time to share your experience with us and for your kind words. We look forward to welcome you back in a near future. Em primeiro lugar agradecemos a sua avaliação do The George. Ficamos muito felizes por saber que a sua experiência connosco foi agradável. Esperamos poder contar com uma visita num futuro próximo. I was with highs expectations but at the end I felt disappointed! Don’t know if it was because I used the promo porto restaurant week but I was expecting the waiters to tell me about the food and it was about. But they were nice and the restaurant it’s beautiful.. but the mood was strange. First of all, thank you very much for your precious feedback about The George. We're so sorry to know that your experience was disappointing, it's not part of our service standards not presenting the food to our guests. Although most of our restaurant staff has lots of experience and are very knowledgeable about all the best pratices in order to provide a perfect service, sometimes everything just seems to go the wrong way. Our sincere apologies and we hope you will give us another chance to prove you that we are capable of surprising you in a much more positive way. Great service. Really tasty food. Would go back. Thank you so much for sharing your experience at The George and for such kind words. We look forward for another visit. Loved everything about our luch at The George! Beautiful views, cosy ambience, delicious food and fantastic service. We had the 30 % off deal so the meal had a very good value for money. Even without the discount the prices are very correct and not explensive at all. We will return for sure. Thank you so much for taking the time to share your experience at The George with us and for such kind words. It's a delight to hear that we could meet your expectations and could impress you with our food and service. We look forward for that return. Fantastic position by the River Douro, excellent food and service. Would highly recommend this restaurant. Thank you so much for sharing your experience and for your kind words. Nice food, particularly the ‘arròs caldós’ with fish. Very friendly people, they gave us one of the top tables of the restaurant and respected the discount. Thank you for taking the time to tell us about your experience at our Restaurant. It's such a joy to know that we impress you with our service. We look forward to receive you again in the future. Thank you for taking the time to share your experience at The George. It is very important to us to have an honest opinion from our guests, so we know how we are doing and where we need to improve. It is, however, unfortunate to see that we did not meet your expectations. So we hope you can give us another chance to show you we can do better. Looking forward receiving you back soon. First floor venue with nice view across River Douro to Porto. All 5 members of my family enjoyed their main course. Certainly a lot better than the fare on offer in the many waterfront establishments nearby. We had a wonderful Christmas meal here. Everyone dish was visually stunning and delicious. The meal was abundant. The staff was amiable and helpful. The location has views of the river. Truly charming. I would return any time! Very nice and cozy restaurant in front of the river, traditional Portuguese food of good quality. The service is very friendly. Highly recommended! Extremely cozy space also also due to the friendliness and refinement of the staff. Worth to mention also the excellent location with a privileged view over the city of Porto (Ribeira). 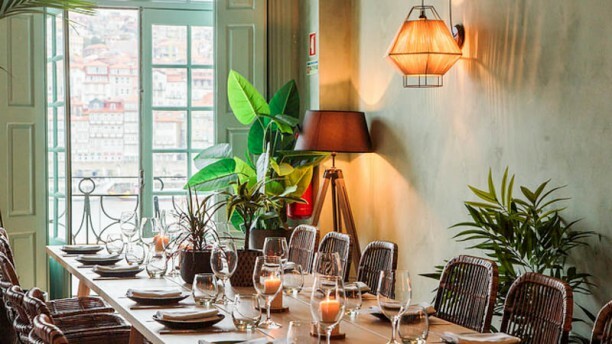 What struck me most was precisely the food, which can be generally characterized as reinvented traditional Portuguese food, keeping the typical ingredients and the essence of the dishes, but giving some subtlety and lightness to them. I was particularly surprised with the mushroom and beans stew and the pork mixture with spinach cream (well, in contrast with the typical Portuguese braised pork cheeks, the flavor was way too bland, which I’d personally consider a minus). Totally worth trying the sautéed octopus with fried rice balls as well. Concerning the desserts, the French toast is not definitely the best in town, but the combination with the roasted apple foam makes it in my top 3 from now on. This was our second meal at the George. We returned as our first was brilliant. The food was prepared and served totally differently to how it was served to us the first time. The tartare was unbalanced and spicy with peppers, whilst the forsythia time, it was amazingly balanced. Thank you for sharing your feedback on The Fork, unfortunately this time we weren’t able to impress you, we’d like to invite you back to try our new winter menu, and leave you with far better memories.